Let it snow, let it snow, let it snow! I like snow when I have no where to go and can snuggle up with cocoa and a Chocolate Peppermint Bear Donut and admire it. 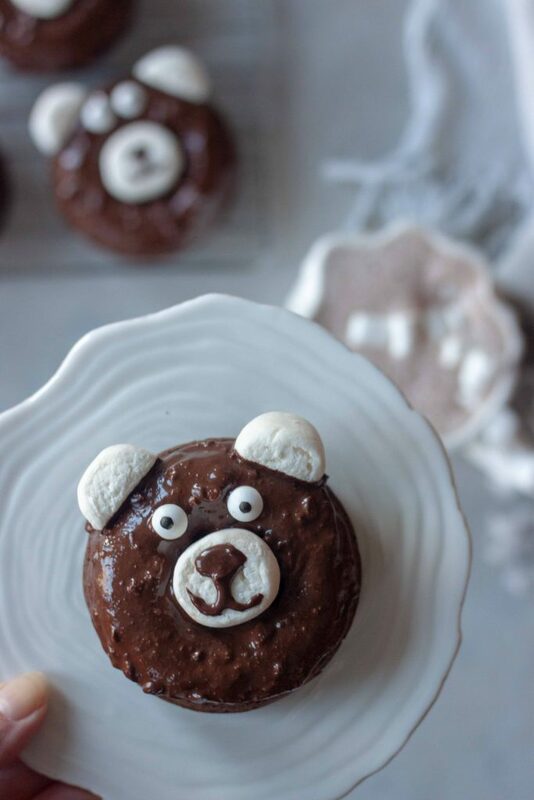 Ok so maybe it doesn’t have to be a bear one I’d settle for just sprinkles but I made bear ones and they were so cute I decided to share that version with you today. Maybe it’s the mama bear in me coming out. The recipe is the same and you can embellish them as desired. It might be Monday but the girls don’t have school today so I think that calls for a slow lazy morning and donuts. After a long busy 3 day weekend (4 counting today) seeing a family friend preform in Mary Poppins, a house full of teenagers sleeping over for S’s birthday, more remodeling, snow…. I’m exhausted and not sure where the weekend went to. We weren’t able to get a Christmas tree but my mom did come down this week and her and A (10 years old) hung some lights and decorated outside a little. She was super excited and it melted my heart and made me smile. Tonight S and I are going to a concert with her best friend and her mom so sleeping in is how I hope to start today and the week. I’ll be wanting coffee for sure tomorrow morning. Although these donuts are quick and easy and could easily be made in the morning if you had a few extra minutes and weren’t looking to grab and go. If you went with just sprinkles they can easily come together in under 30 minutes. Oh and speaking about needing extra coffee add a little to these for a fun peppermint mocha twist which is definitely mama, and papa, bear approved! These donuts are simple and easy with ingredients you probably already have on hand. A basic chocolate donut so if peppermint isn’t your think you can easily adapt them. The peppermint comes in with the icing. I recently fell in love with Thin Mint Cocoa Bar In A Jar, which is easy to melt up and use for icing the donuts. The little pieces aren’t cookies but are actually cacao nibs. I like the texture it gives them. There are two other icing options. You can use cacao powder, coconut oil, maple syrup, and a little peppermint or you can melt your favorite mint chocolate bar and mix with a little coconut oil to help keep it from hardening. Both are favorites and I usually just go with whatever I have on hand. If you have kids the bears are really fun and cute to make for them or with them. 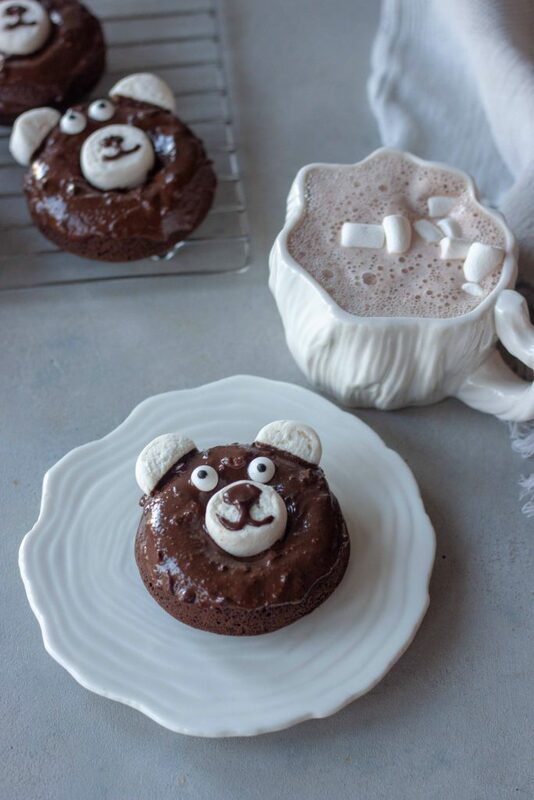 All you need is a few marshmallows, eyes (or use mini marshmallows cut in half, and a little melted chocolate. 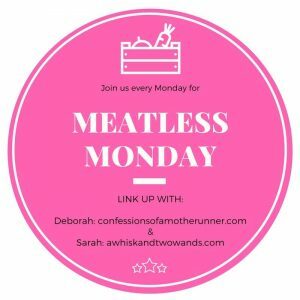 Today is Monday, aka Meatless Monday. If you have a recipe to share I hope you link up with Deborah and I below. If not I hope you find a few other inspiring recipes linked up below. 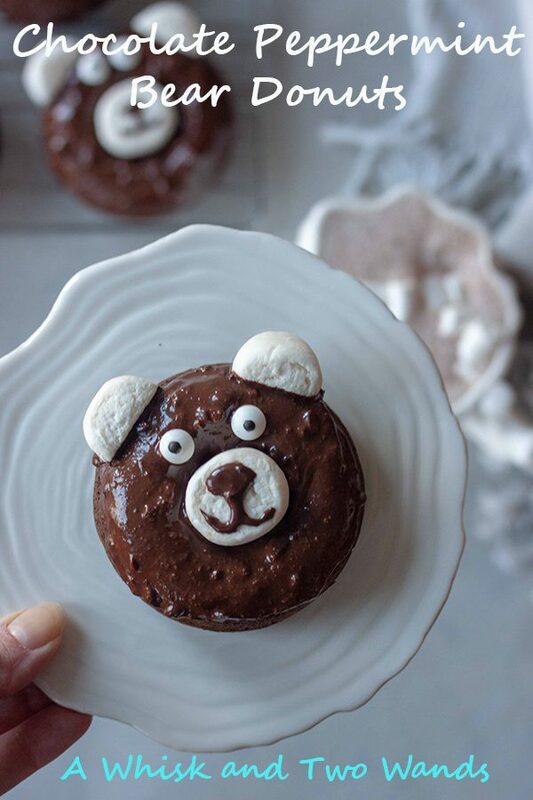 Simple delicious Chocolate Peppermint Bear Donuts are gluten free and vegan friendly chocolate cake donuts topped with chocolate mint icing and marshmallow to look like bears that kids will love. In a small bowl combine milk and lemon juice and let sit for 5 minutes. If using a flax egg or egg substitute prepare and let sit for 5 minutes as well. In a large bowl combine flour, cacao powder, baking powder, baking soda, and salt. In another bowl combine milk mixture, sugar, vanilla, coconut oil, and egg. Mix the wet ingredients into the dry and mix until just combine. Spray donut pan with non stick spray. For nice round looking donuts put mixture into a frosting bag or plastic bag and snip the end. Pipe the mixture into your prepared donut pan. Remove donuts from the oven and let cool for 5 minutes before removing and placing on a wire rack. While the donuts are cooling melt and/or mix together ingredients for icing of choice. Cut each large marshmallow in half, take one of the halves and cut that in half for the ears. Dip donuts in icing or ice with an offset spatula. 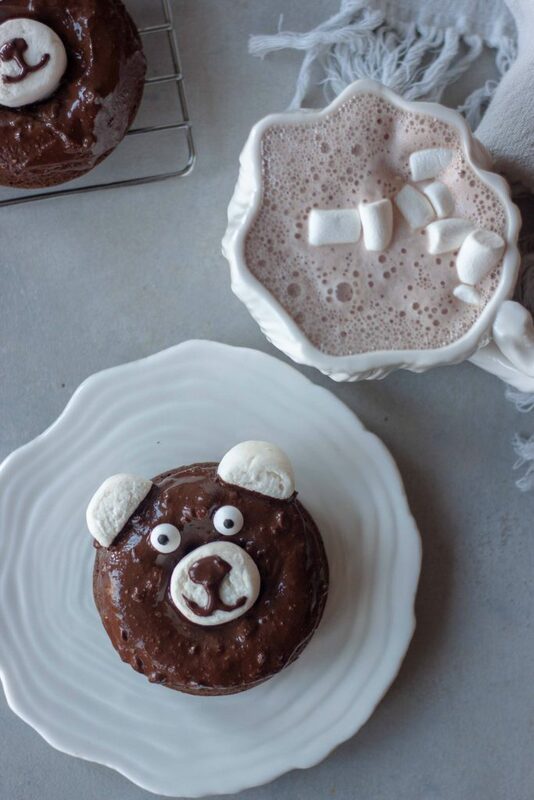 Decorate with marshmallow half circles for ears, the other half in the middle for a nose, and add the eyes to each after dipping so they stick. Place melted chocolate in a piping bag or plastic bag and cut the corner so you can draw on nose and mouth (along with eyes if using marshmallows instead of candy eyes). Let set 5-10 minutes. Enjoy with a cup of cocoa! *Cake flour makes the lightest donuts. For gluten free I like to use a baking blend. oh my how adorable are these!? I bet the girls loved them. Thank you Deborah, they did! I’m looking forward to making fun cute food again as the girls are/have growing out of that phase. So frickin’ cute! 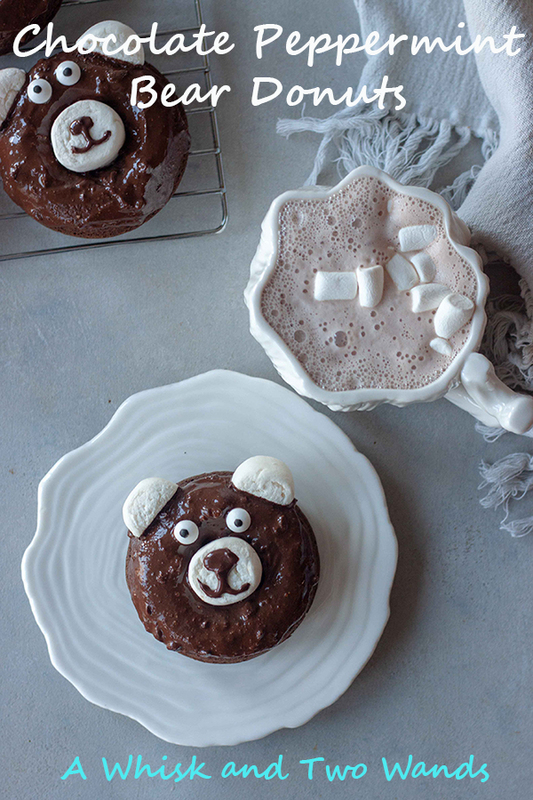 And brilliant – I never would have thought to put a marshmallow in the middle for the muzzle. That is just easy and delicious!!! Okay – just the cutest things ever! And we all know cute things get eaten quickly so…game on! So cute! I LOVE THE SNOW! (remember that Boulder Blizzard we were in?!) 🙂 these are the cutest – totally sharing with my friends with kiddos! These are SO cute!! What a fun treat to make and enjoy on a snow day (or really any day lol!)! !